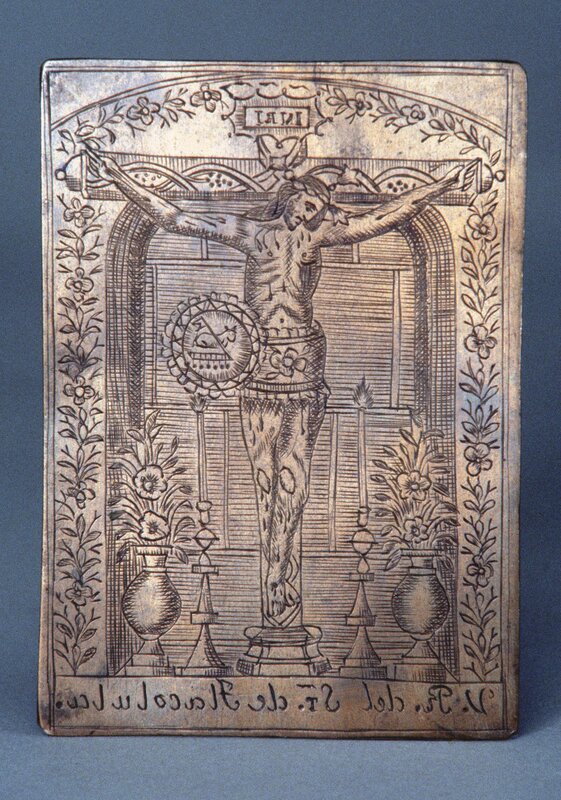 This small copper plate, made in Mexico, has been engraved with an image of the Crucifixion. After the image was incised into the plate, ink would be rubbed into the recessed lines and then the image could be transferred, in reverse, to a piece of paper. The image represents the Señor de Tlacolula, a devotional statue of the crucified Christ that still hangs today in Tlacolula’s 16th century church, in Oaxaca, Mexico. Below, the text reads: V[erdadero] R[etrato] del S[e]ñ[or] de Tlacolula ("True Portrait of Our Lord of Tlacolula"). Images of Christ, flanked by vases filled with flowers and candlesticks were common in 18th-century Mexico. In this scene, these accouterments evoke the actual altar where the original statue of Christ of Tlacolula resides. At the side of the crucifix is an image of an “Agnus Dei,” or Lamb of God, a metaphor for Jesus Christ. 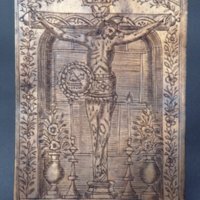 Just as the faithful could take away this printed image to remember the statue that inspired it, so too could they take away images of the Agnus Dei, cast into wax. This plate, which measures approximately 11 inches in height (ca. 28 cm), is unsigned. The artist may have been an engraver in Oaxaca, no doubt for local devotees of the cult, many of whom flocked to Tlacolula to celebrate the Señor’s feast day on the second Sunday in October. Engraved plates were used widely in Europe and the New World. They were fairly simple to make, with the image (in reverse) being scratched onto the plate with a metal tool called a burin. Metal plates were quite durable and thousands of prints could be made from them. Some publishing houses in Europe used the same metal plates for book illustrations for over a century. In this one, the artist has used a burin to incise lines of different width onto the plate; shadows in the image were created by hatching and cross-hatching. Once they no longer commanded a public, engravers’ plates were often polished and re-engraved for another print run, or used for some other purpose. Thus surviving engraved plates, such as this one, are not very common, although sometimes they are preserved when their reverse sides were used as the ground for oil paintings. This plate seemed to have no such “second life,” but other than this, we know little about its history. Prints, either imported from Europe or made locally in the colonies, were the most common way people could possess a works of art, but many owners valued them more for the devotional image they showed than any artistic skill they displayed. Then and today, prints would have been found in the homes of people from all social classes. In the 16th century, they were an important means though which indigenous artists learned about European styles. Subsequently, prints were an important way of transmitting the latest imagery and styles from Europe to the New World, and for disseminating religious cults. Donahue-Wallace, Kelly. 2001. “Printmakers in Eighteenth-Century Mexico City: Francisco Sylverio, José Mariano Navarro, José Benito Ortuño, and Manuel Galicia de Villavicencio.” Anales del Instituto de Investigaciones Estéticas 78: 221-234. Phoenix Art Museum. 1999. Copper as Canvas: Two Centuries of Masterpiece Paintings on Copper, 1575-1775. New York: Oxford University Press.